As you know The I AM Program is all about putting children in touch with their true power. We do that through conscious loving connection, and more than anything else seeing the children for who they truly are, beyond any perceived limitations, powerful beings capable of creating a life of success and happiness. To do this most effectively we must first be able to see ourselves in the same way. If there are aspects of self-love, connection, and personal awareness you are struggling with, this course cold be for you. Learn Keys for Self-soothing ~ Address your emotions, awaken a sense of love for yourself. Learn to let yourself off ‘the hook’, forgive yourself and release guilt. Give birth to your creativity ~ Empower yourself, express your emotions and see the wonder in ordinary life. If you are feeling stuck, learn expressive and powerful tools to set you back on track. Enjoy general wellbeing and a more positive perspective. Learn to love your body ~ Feel renewed energy and motivation, drop judgement. See yourself in a new way, enjoy health and happiness and a relaxed state of mind. Find Your Divine Connection ~ Connect with your inner being, grow your light and practice deliberate life creation. The private one on one course over email is available, joining FB private group is not compulsory. 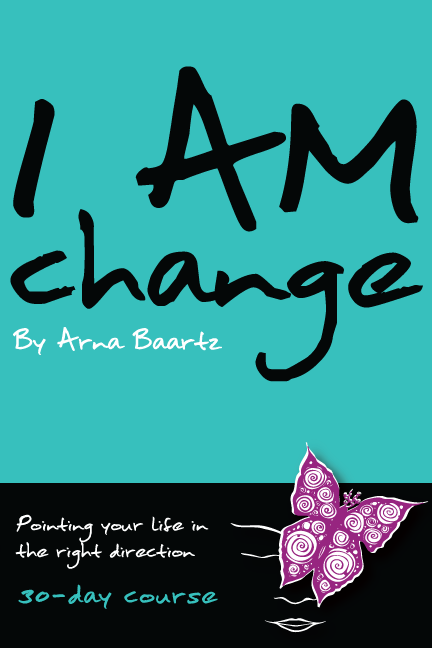 Arna Baartz is the Founder and Director of the I AM Program and the creator of the I AM Change ~ Creative Course. Arna is an Emotional Intelligence/Self-Esteem Educator, visual artist and mother of eight wonderful children. She is a Wild Woman Writer for the Wild Woman Community. Click here for her contributions. Arna developed the I AM Change ~ Creative Course as a result of her own life experiences and personal journey into consciousness and positive transformational change. 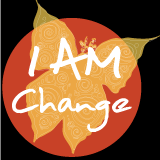 I AM CHANGE can truly bring positive transformation and direction to you. It is time to BE The Change you wish to see in the world in a literal sense and we have a new and empowering way to bring that change into your life. Do You Feel one or more of these? This course is for anyone who desires Change on any level in any area of their life. Many contemplate changing direction of their lives but few actually summon the courage to take the first step. WHY? Because to change your life you must change the way you think. And although this is easy to say it takes courage to actually do it. It is a world changing action to understand ourselves, to recognise our need to clean up our own mind and take the steps to positive CHANGE. With an awareness of our patterns and behaviours, we CAN change the way we think and feel about ourselves and what we are capable of achieving. This experiential course gives you the tools and support you need to delve into your habitual negative thoughts and conditioning and make the necessary changes to live a life you genuinely enjoy. The course is delivered online and although you do it in your own time, you have complete access to the private FB group and my email support as you need it along with encouragement emails unless you opt out. The purpose of the group is to support and collaborate with each other in Being THE CHANGE! Please Note: Undertaking this course takes courage and commitment, there is the probability of powerful results and intense personal insight. You will be offered support throughout as the movement you create can propel you into brand new territory. There may be emotional discomfort as your mind and body shift to a new way of perceiving your self and the world and you may want to give up. But please know, if you come along for the ride, committing to yourself for this intensive, the broader and most beautiful part of yourself has already decided that YOU can handle the journey and you have the potential of emerging more whole than you have ever been before.